Advantages: Thorough coverage of the He 162’s conception and development; detailed technical, camouflage and markings information; instructive build of 1/48 Tamiya He 162 kit. 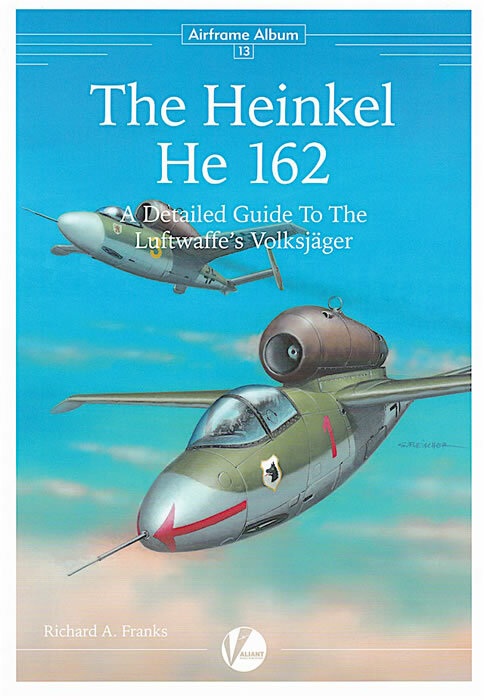 The He 162 is a subject I suspect appeals to most modellers of World War II aircraft, so it’s good to have a reference of this substance devoted to the type. Well written and illustrated, this book will be my primary guide when I tackle my 1/32 Revell kit – highly recommended. The Heinkel He 162 was created out of Nazi desperation in the closing months of World War II. Hastily designed and rushed into service, it almost certainly killed more German than Allied pilots. 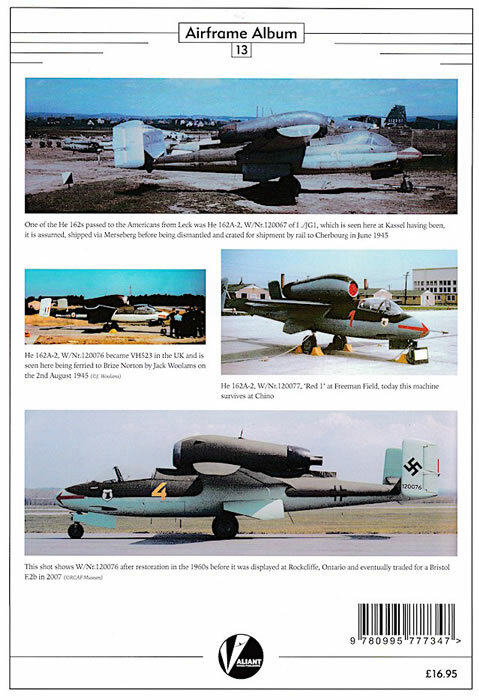 Despite – or perhaps because of – its inherent flaws, the He 162 is popular with aviation historians and modellers and so this latest addition to Valiant Wings’ Airframe Album series will be of interest to anyone looking for information on the type. Introduction. This title is something of a misnomer, as the section runs to 20 pages and covers the He 162’s entire development, production, and operational and postwar use. Franks successfully interweaves the hard facts and figures of the Voksjäger project with the Reich’s surreal political atmosphere and fantastical expectations for the new fighter. 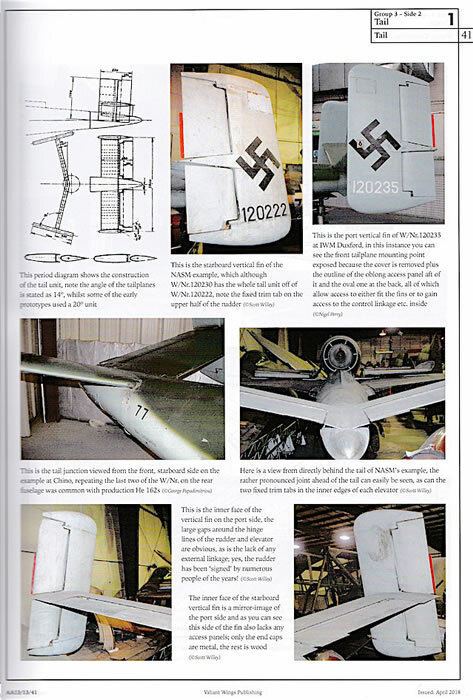 More than half of the pages are devoted to the evaluation of captured He 162s, which of course is from where much of our knowledge of the aircraft comes. The most text-heavy part of the book, this section is also generously illustrated with period photographs. 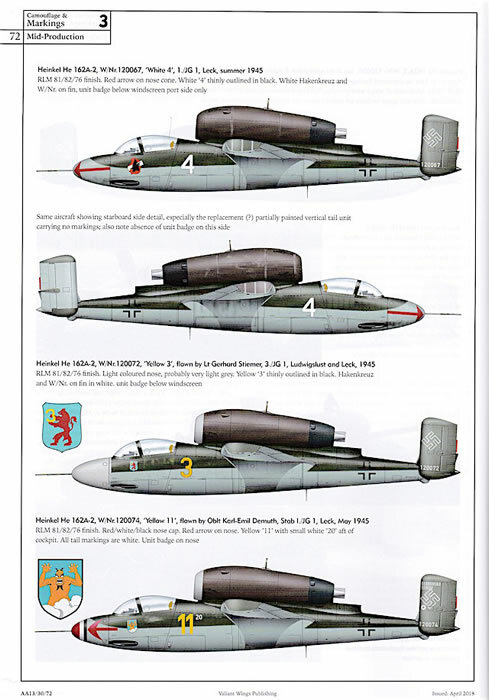 Chapter 1: Technical description uses a combination of technical drawings and colour photos of He 162 survivors to provide a comprehensive walkaround of the He 162 airframe. This will be great interest to modellers wishing to check the accuracy of kit parts or add more detail to their model. 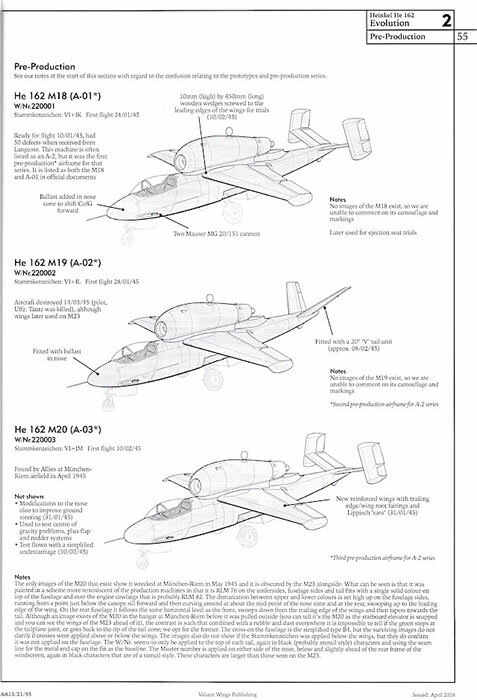 Probably my favourite part of these books, Chapter 2: Evolution – Prototype, Production and Projected Variants is structured around a series of front three-quarter view line drawings that show key He 162 subtypes from all stages of development. These include the M19 v-tail and M42 impulse duct engined variants, along with the anticipated He 162 C, D, E, S (glider) and Mistel versions, with the differences between each airframe type are clearly pointed out. 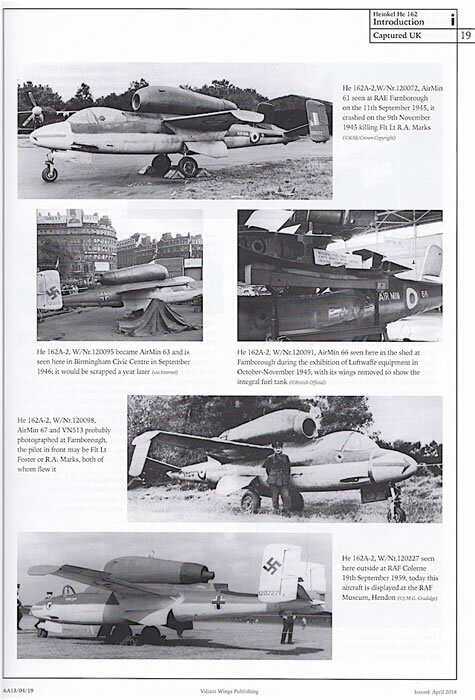 Chapter 3: Camouflage and Markings shows that – the type’s limited operational life notwithstanding – He 162s were painted in a surprising variety of schemes. 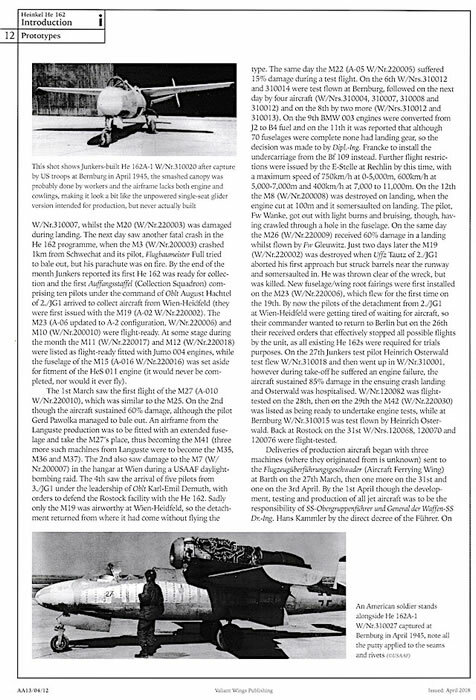 Franks points out the finishes that identify pre-, early, mid and late production machines from Heinkel, as well as those applied to Junkers-built and captured He 162s. Chapter 4: Model. 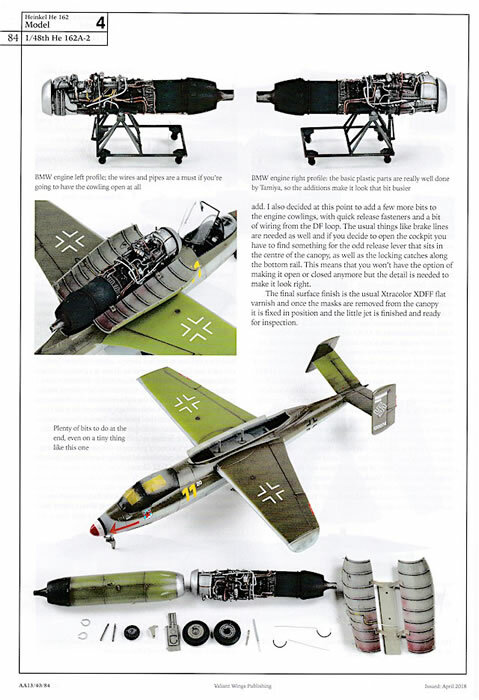 One of the strengths of Airframe and Miniature publications are the quality of their kit builds, and this volume is no exception with Steve A. Evans doing his usual excellent job on Tamiya’s fine 1/48 Voksjäger. As a modeller who prefers 1/32 scale I would’ve loved to see Steve tackle Revell’s big He 162, but as Franks reasonably points out at the beginning of the chapter, “model builds are not a major component of the Airframe Album series”. 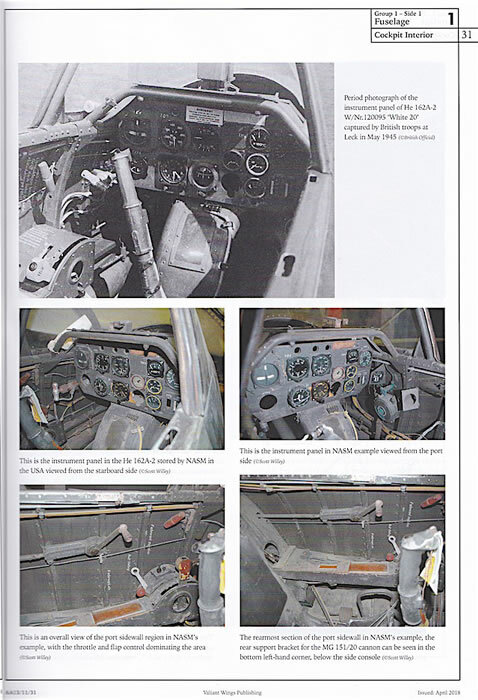 Steve’s build is well described through text and photographs, and will be a useful guide to anyone building the He 162 in any of the major scales. Three short appendices follow the main text, listing Komet kit and accessory/decal/mask releases to date, as well as a bibliography for further reading. I should also mention the glossary at the beginning of the book, which includes useful explanations of abbreviations, and English translations of German words. The He 162 is a subject I suspect appeals to most modellers of World War II aircraft, so it’s good to have a reference of this substance devoted to the type. The book’s production values are high, with well-written and edited text and a good variety of clearly reproduced illustrations. I know that it will be my primary guide when I get around to tackling my 1/32 Revell kit, and I recommend it highly to anyone else who is also contemplating a Voksjäger build.